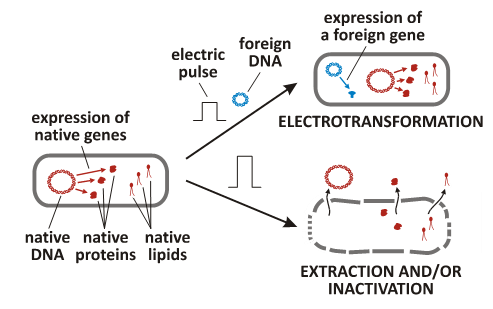 Among the most well-known electroporation based applications in biotechnology are: electrotransformation, extraction of biomolecules from microorganisms and inactivation of microorganisms (Figure 1). Figure 1: Applications of electroporation in biotechnology (adapted from Kotnik et al., Trends Biotechnol. 33: 480-488, 2015). DNA is introduced into microorganism by means of reversible electroporation. Microorganism survives the process and expresses inserted gene. This technique can be used for producing a variety of biomolecules in large amounts (i.e. antigens, toxins, hormones and enzymes), adapting microorganism to diverse conditions and for basic research. In most frequent methods used for extracting substances from microorganisms their membrane is severely damaged and release of unwanted substances (i.e. host DNA or endotoxins from bacterial envelope) is unavoidable (Figure 2). While extraction by means of electroporation selectively releases biomolecules without the formation of debris and extraction of unwanted substances contaminating the extract. Figure 2: Treatment of bacteria. Scanning electron images of Escherichia coli bacteria: (left panel) not treated; (middle panel) subjected to electroporation; and (right panel) mechanically disintegrated. Scale bars represents 200 nm (from Haberl Meglič and Kotnik, Handbook on electroporation, Springer International Publishing Switzerland, 2016). If a cell is exposed to a sufficiently high electric field, its membrane becomes permanently permeable, resulting in cell death. This method is used to remove pathogenic microorganisms from various water sources, hospital wastewaters and liquid food, without destroying vitamins or affecting the food’s flavour, colour or texture. Electroporation, better known in food technology as Pulsed Electric Field treatment (PEF), is a method of treatment of plant tissue that due to its non-thermal nature enables preservation of the natural quality, colour, and vitamin composition of food products. The principal reason is that, unlike mechanical, thermal, chemical, enzymatic, or other sorts of treatments already used for decades if not centuries for food processing, electroporation seems to preserve the cell wall more or less intact while permeabilising the cell membrane, as illustrated by Figure 1 below. The range of processes where electroporation was shown to preserve quality, increase extraction yield, or optimize energy input into the process is overwhelming, though not exhausted. Examples include (but are not limited to): increasing quality and yield in extraction of valuable compounds and juices; acceleration of the dehydration process; increasing tolerance of (raw) food materials to damage during freezing (by facilitating vacuum impregnation of tissue with a cryoprotectant); etc. New applications of electroporation in food technology are discovered and developed continuously, as this is a highly active area of research. 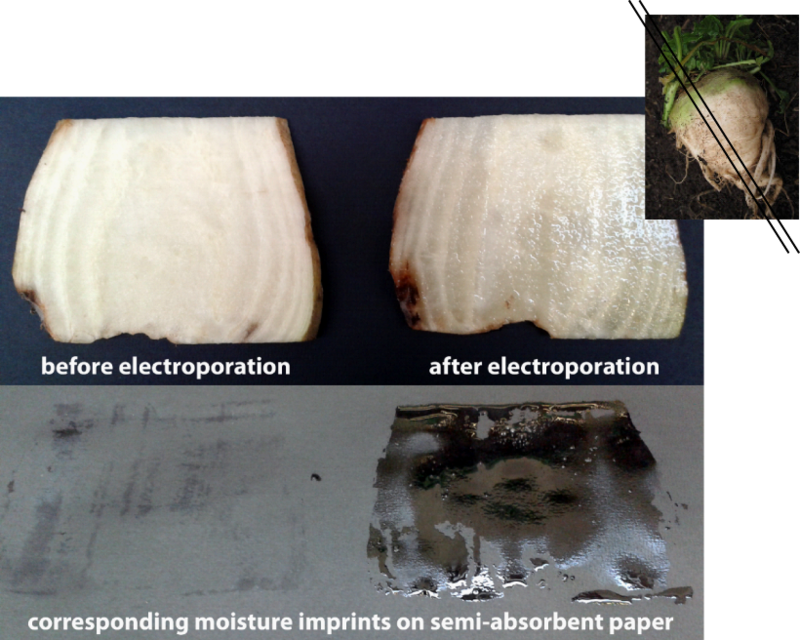 Figure 2: Spontaneous release of liquid from electroporated slice of sugar beet taproot tissue (left – intact sample, right – electroporated sample). Electroporation or PEF is also – due to its antimicrobial action – subject of research as one stage of the pasteurization or sterilization process, as well as a method of plant metabolism stimulation. For an introductory review paper on various applications of PEF in the food technology area, see for instance here (also available here).